Hospitality Village is a ministry of Episcopal Church of the Resurrection, dedicated to serving the unhoused in our community. Hospitality Village grew out St. Vincent de Paul’s car camp program. 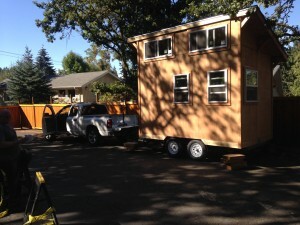 The initiative started out with three small Conestoga huts for the unhoused. It has since evolved to providing tiny houses, constructed by parishioners, with parish resources, which are 8 by 12 feet structures with heat and electricity. 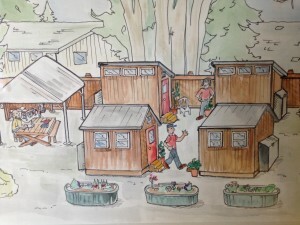 There are currently four such tiny houses, clustered around a common shelter and protected from the comings and goings of our parking lot by planters. These homes provide transition housing for the unhoused who are now supported by a case worker, hired by the parish, to assist our guests with their journeys toward stable housing. We now have four tiny houses in Hospitality Village, which are occupied by individuals and in one case, a family, who have committed to a plan (with the Parish’s help) to transition to more stable, permanent housing. Hospitality Village is overseen by a committee of the Parish that meets monthly to set policy and address issues facing the ministry. Our work involves a beautiful combination of talented carpentry, compassionate fellowship and intention toward a comfortable future for those in our midst for whom the basics of life cannot be taken for granted. We have assisted members of our community through this vital ministry, many of whom have opted to become active members of the Parish, contributing of their time and talent to our service to the community. Our work through this ministry counts as some of our most impactful in terms of helping members of our community change the trajectory of their lives. Our work has been recognized in a number of media reports, including KVAL, and the Register Guard. Want to get involved? Have money, time, or supplies to donate? Call our office at 541.686.8462, we’d love to have you join our group of volunteers! We are grateful to the many donors that have made this project possible, included members and friends of the Church of the Resurrection, and our business supporters, including Beacon Electric, Bob Weir Tree Service and Arriving By Bike. Thank you!